The phenomenally popular book Heaven Is for Real—the bestselling evangelical book in the last ten years—has remained on the New York Times best-seller list after more than three years, with nearly 8 million copies sold. It’s also been translated into 25 languages and has now been made into a major movie by Sony Pictures, released in theaters this week. 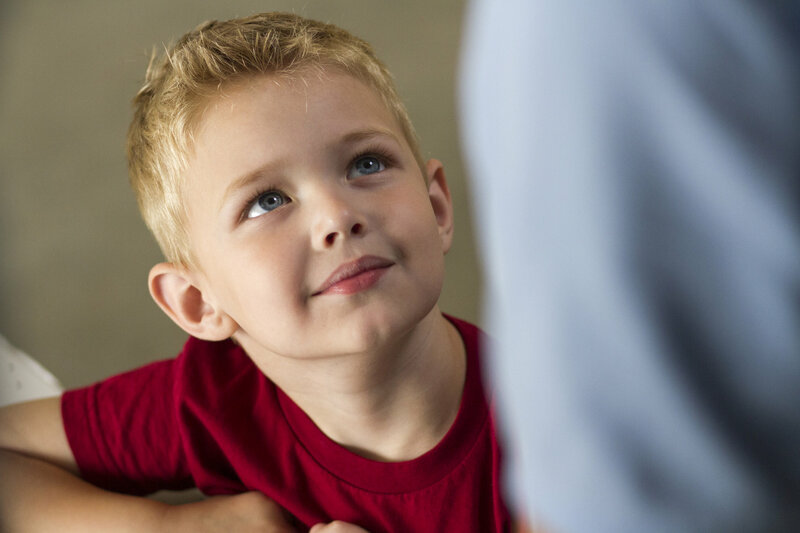 The book was written by an evangelical pastor, Todd Burpo, and tells of his then four-year-old son Colton, who survived emergency surgery and later told his family that he went to Heaven. Colton described seeing Jesus and meeting his miscarried sister and his great-grandfather, who died before he was born. As I shared in my past blog, I don’t see a false gospel in the book’s account of Heaven. I rejoice that Jesus is portrayed as the only way to God, in keeping with John 14:6 and Acts 4:12. I could have wished for a greater emphasis on confession of sin and repentance, but on major biblical issues I don’t think Heaven Is For Real, the book, contradicts Scripture. Yet on some details, such as people in Heaven having wings and halos, something the Bible never depicts, I’m honestly just…uncomfortable. Still, God uses many things without my permission, and despite my reservations! 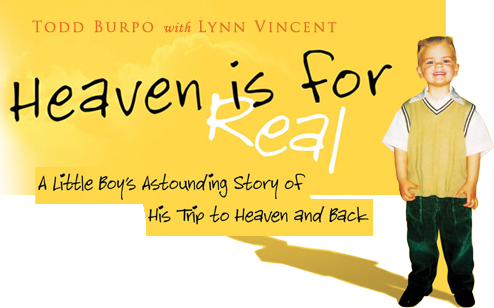 I emphatically agree with the title: Heaven Is for Real. However, it is not because Colton Burpo says he’s been there, but because the Bible says so! I’ve met the director of the film, Randall Wallace, and enjoyed a long and delightful conversation with him several years ago. He wrote the screenplay for Braveheart, and directed The Man in the Iron Mask and Secretariat, a movie Nanci and I really enjoyed. I really like Randall, and he struck me as a sincere believer in Jesus. I have to say it concerns me that the movie seemed to leave out any mention of sin or the gospel, or any focus at all on God’s good news of salvation in Christ alone. Jesus is in the movie, to be sure, and the marks in His hands are mentioned. But I did not see the need to turn to Christ and believe in Him, to confess and repent of sins and bow our knees to Him as Lord. It’s true that believers watching it already know that Jesus is the way, the truth, and the life, and that no man comes to the Father except through Him (John 14:6). But I’ve heard people speak of what a great outreach movie this is for unbelievers. 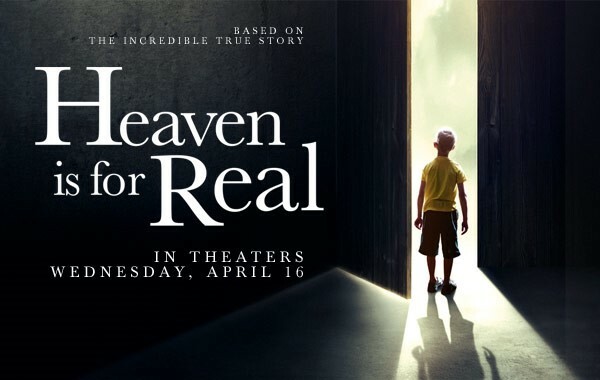 It seems like the movie, unintentionally, may confirm the false assumption that they too will one day enter Heaven just as they are, and don’t need to come to grips with their sin and turn to Christ, who seems likely to lovingly welcome them into Heaven when they die. There was one part of the movie that made me decidedly uncomfortable. It portrays a graveside conversation between Pastor Todd Burpo, Colton’s dad, and a woman in the church whose son, a soldier, had died. The woman asks the pastor whether he thinks her son is in Heaven. He in turn asks her whether God loved her son who died as much as He loves Todd’s son, Colton. The pastor’s logic seemed to me to be that if God took Colton to Heaven, and if He loves this woman’s son as much as Colton, then surely her son would be in Heaven too. This reasoning is fatally wrong. God loved the world so much that He sent His Son (John 3:16), yet there is also the need to turn to Christ for salvation (John 1:12; Romans 10:9-10). In the movie, Heaven is apparently a place of great comfort and beauty where most everyone automatically goes—at least, there seems to be no suggestion to the contrary. As far as I saw, there was not a hint of the Bible’s teaching of Hell as our default destination unless we are converted and regenerated and thereby can enter Heaven with the righteousness of Christ. The last lines of the movie come from Todd Burpo, who says: “God had a different plan. God crushed my pride, opened my heart to love. And all I have to do, the one thing this love requires, is that I let others know they're not alone.” That line might feel good, but it sounds hollow when compared to the gospel of Jesus. A more biblically accurate line would be, “The one thing this love requires is that I let others know Jesus died for their sins on the cross, rose from the grave, and invites them to believe in Him and receive His gift that they may live forever in Heaven instead of perish in Hell.” Okay, that’s a long line, but you get the drift. :) That the one thing love requires is to tell people they’re not alone is something it is hard to imagine Jesus, Paul or John saying. Why not just quote John 3:16, which tells us about what God in His love actually did: “For God so loved the world, that he gave his only Son, that whoever believes in him should not perish but have eternal life”? This movie has some good themes for Christian living, but it speaks very little about who Jesus really is and what He has done to secure the offer of salvation. It powerfully portrays Todd’s personal struggles with his faith, but it’s disappointing that with the title Heaven Is for Real and with the Burpos’ genuine Christian faith (which I do not doubt for a moment) there is no mention of what is necessary to find eternal life and actually go to Heaven. Yes, I’m well aware that the presence of the gospel in the story, the mention of sin and repentance and the need to turn to Christ in faith, would not be popular among many critics and viewers. But when the movie is about a Christian pastor and his family and the central theme is about going to Heaven, it does seem reasonable to expect the gospel to be made clear, even if briefly. It’s also puzzling that there’s very little Scripture in the movie. One of the rare times Scripture was used, “on earth as it is in heaven,” it was taken out of context. I was not looking for sermons and long Bible citations, but there is nothing like the power of God’s Word (in context). One other concern is that I have seen such great excitement among Christians in response to this book, and I’m sure that will be true of the movie too. I’m not questioning anyone’s sincerity, but this is an experiential account which, if it really happened, at its best simply confirms what Scripture has said all along. Yes, Heaven is real, but we already knew that, didn’t we? God’s Word has told us that all along. When there is so much fanfare about accounts that simply confirm what the Bible says, I wonder if we trust the accounts more than the Bible itself. As I share in a post about Dr. Eben Alexander’s visit-to-heaven book, while I am not the judge of who has really been to Heaven or Hell, I believe every near-death (or supposed “after-death”) experience must be evaluated in light of God’s Word. While curiosity is understandable, don’t base your theology of Heaven on any book or movie that tells of someone’s personal experience and memories, no matter how sincere they may be. And as I share in another post about Mary Neal’s book To Heaven and Back, I am concerned that even evangelical publishers are now disseminating false doctrine through personal stories of visits to Heaven. In the movie, Todd Burpo’s character has a line that says, in effect, that the Bible tells us to believe as children. Respectfully, while childlike faith is commendable, as our Lord teaches (Luke 18:16), that does not mean we should automatically believe anything or anyone, child or not. Certainly I would not expect you to automatically believe anything I say. In fact, the Bible, in numerous passages, emphatically warns us not to believe whatever we hear. We should not be gullible, as this opens the door to false doctrine (1 John 4:1; 2 Peter 2:1; 2 Corinthians 11:4; 2 John 1:10). I am not saying the movie is heretical. I am saying that like everything else, it is subject to biblical scrutiny. I know this will appear to some to be overly critical and nit-picky, but when it comes to the basis on which people go to Heaven after they die, I think it’s worth getting it biblically right. Acts 17:11 says, “Now these Jews were more noble than those in Thessalonica; they received the word with all eagerness, examining the Scriptures daily to see if these things were so.” We should eagerly receive God’s Word, examining the Scriptures daily to see whether whatever else is not God’s Word is true. My books are not God’s Word. Heaven Is for Real (the book or the movie) is not God’s Word. The Bible does not tell us to believe whatever anyone says, whether adult or child. It tells us God loves children, but we are to weigh all claims to experience and truth by God’s Word. I know some people will be disappointed that I’m not more enthusiastic about a much-anticipated movie that countless people will love. They’ll consider it judgmental that I could criticize it. I don’t mean no good will come from this. My prayer is that God will use the interest around the movie to open doors for believers to be bold in sharing what Scripture has to say about Heaven and the need for everyone to place their faith in Jesus Christ. While the movie doesn’t make the gospel clear, it can certainly open up doors of conversation with friends and family, in which we can share the gospel. If this happens, God will be pleased.